The city of New Haven, Connecticut, is leveraging $36 million in federal TIGER grants to convert an urban-renewal-era highway spur into more of a pedestrian-friendly boulevard, opening up 10 acres of land in the city center for development in the process. The highway connector, Route 34, links Interstates 91 and 95 with downtown, dumping high-speed traffic onto parallel frontage roads before it comes to a sudden end. Originally conceived in the 1950s as a through connection to the suburbs, the connector was never completed, and instead has acted as both a physical and visual barrier between the downtown district and Yale University’s sprawling medical complex, a struggling neighborhood known as the Hill, where roughly 40 percent of residents live below the U.S. federal poverty line, and Union Station, the city’s main transit hub. Called Downtown Crossing, the project, still in the opening stages, coincides with an ongoing resurgence of New Haven’s downtown, helped along by the millennial preference for urban living and the city’s growing reputation as a bioscience hub, largely fueled by Yale. In the past two years, some 850 additional residential units have opened downtown, and another 1,600 are in the pipeline, according to Michael Piscitelli, the city’s deputy economic development administrator. Of about 80,000 jobs citywide, roughly a quarter are located downtown. The city as a whole still ranks as one of Connecticut’s most distressed communities based on factors like median income, poverty and education levels. Resident unemployment is around 9 percent. City officials have portrayed Downtown Crossing as a way of reconnecting poorer residents, in the Hill and other neighborhoods, with downtown employment opportunities. A cornerstone of the plan is a proposed $400 million mixed-use development that would act as a primary gateway to downtown on a 4.6-acre site (now parking lots) located between the district and Union Station. The Canadian firm LiveWorkLearnPlay has signed on to build the New Urbanist-style development, which would include about 1,000 apartments, office and retail space, a high-end hotel, and a large public square. (Newman is the master planner and architect for the project.) The state has committed $21 million to help with infrastructure costs, but the development has been stalled by problems with underground electric utility transmission lines. As part of his bid to get city approval for the project, developer Max Reim, founding principal of LiveWork, committed to making at least 20 percent of the apartments affordable to residents earning between 80 and 120 percent area median income. In addition, 10 percent of the affordable units must be two- or three-bedroom, and no more than 50 percent of the units on any one floor can be designated affordable — to encourage mixed income throughout the development. Reim also agreed to post jobs with an agency that maintains a local applicant pool. Downtown Crossing’s first phase, completed last year, was jumpstarted by a $16 million TIGER grant awarded in 2010. (TIGER is the U.S. Department of Transportation’s Transportation Investment Generating Economic Recovery grant program.) 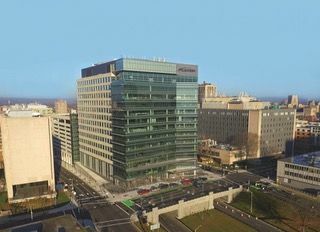 Supplemented by $18 million in state and city funds, the grant allowed for the reconstruction of College Street at grade with the emerging boulevard and preparation of a development site where Carter Winstanley, of Winstanley Enterprises, a key player in New Haven’s bioscience boom, built a $200 million, 14-story office tower as the corporate headquarters for Alexion Pharmaceuticals. “We married the grant to an agreement with the developer, then built the public infrastructure and the private infrastructure together,” says Matthew Nemerson, the city’s economic development administrator. Alexion was previously based in New Haven before moving to the suburbs in 2000. State tax and loan incentives, along with the rise in bioscience activity, helped lure the firm back. It moved into the tower, 100 College Street, a year ago and employs about 1,100 workers, according to a company spokesperson. As part of the development agreement, Winstanley contributed $100,000 toward a new city partnership with Southern Connecticut State University to help guide more residents into bioscience careers. The agreement establishes a bachelor’s program in biotechnology along with adult certification programs, according to Piscitelli, and is supported by internship opportunities and an articulation agreement between the university and Gateway Community College, which is located downtown. Now, aided by a $20 million TIGER grant awarded last July, the city is starting the process of integrating Temple Street, another cross street just below College, into the boulevard and preparing a second site for development as mixed use or office space. “We do not have a development partner yet — in this case, the infrastructure is ahead of development,” Piscitelli says. Additional funds will be needed to build some sort of connecting structure to cross to the far side of the boulevard. In announcing the grant, U.S. Senator Richard Blumenthal declared in a statement that New Haven has for too long “endured a misguided, man-made highway to nowhere that has isolated neighborhoods and stifled development.” But Newman notes that at the time it was conceived, under urban-renewal champion Mayor Richard Lee, it was viewed as a smart way to get cars from the emerging suburbs back into the city. A separate redevelopment plan is in place for the Hill, which still bears the scars of that knife: too many underused and neglected properties and an abundance of surface parking lots. The new vision is for a walkable, mixed-use district that is better integrated with Union Station. Last year, after extensive discussions with neighborhood residents who wanted to make sure the development didn’t simply amount to another Yale expansion, the city reached an agreement with a Stamford, Connecticut, developer to begin the first phase, which will include apartments, retail, research and office space on close to 12 acres. Anstress Farwell, the president of the New Haven Urban Design League, an independent planning and zoning watchdog, noted that the city still faces the challenge of how to redevelop a subsidized housing complex located right across from Union Station. Called Church Street South, the complex was allowed by its owner to fall into such disrepair that, in 2015, many units were condemned and residents relocated. The design league is advocating for more pedestrian- and bike-friendly features in the overall Downtown Crossing plan, as well as a reduction in the number of parking garages and lots downtown coupled with improvements to mass transit. Lisa Prevost is a New York City-area journalist specializing in housing and real estate development. She is the author of “Snob Zones: Fear, Prejudice and Real Estate” (Beacon Press, 2013), and a regular contributor to The New York Times.